This week, as the snow melted away, there was the realization that the school year will soon start melting away. We are starting to see more field trips, programs, and concerts pop up on the district calendar. On Wednesday night, I was fortunate to attend the WHS National Honor Society Induction Ceremony, in which 78 students were inducted. 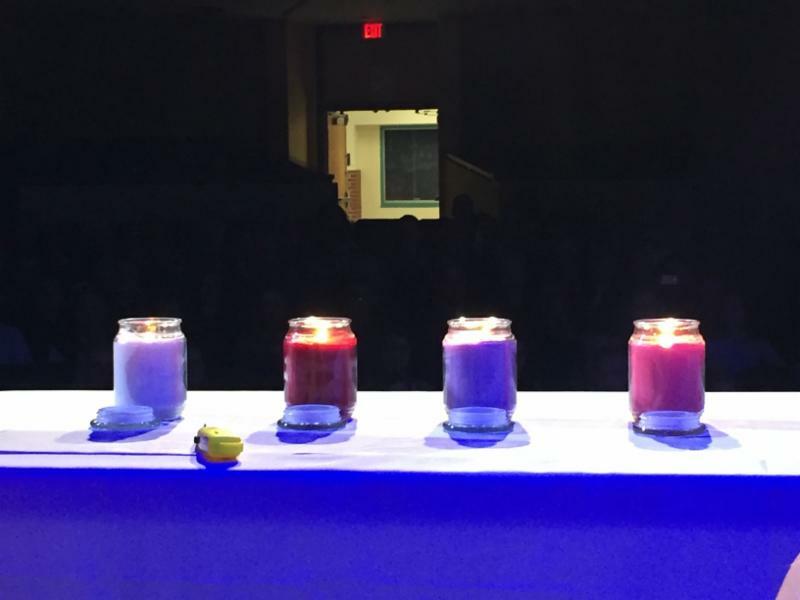 Part of the ceremony involved lighting four candles, which represent the four pillars of scholarship, leadership, service, and character. The words of the speaker, Mrs. Laura Cerletty, WHS science teacher, and the slideshow presentation of the NHS service projects were good reminders of the opportunities we provide students to build lifelong traits beyond the academic skills in the classroom. Learning extends beyond the four walls and the textbook covers. Yesterday, you should have received an Infinite Campus message with a letter attached that provides information about the districtwide evacuation drill on Monday, April 30. If you have not read the letter, please do so as it contains details and information about the event. Any parents available and wanting to participate in the parent reunification portion of the evacuation drill on Monday should contact the appropriate building principal prior to this weekend. Board briefs are simple summaries of our board meetings. Without having to labor through or wait for the comprehensive board minutes, you can access what changes the board approved at each of their meetings! The latest board brief (for the April 23 meeting) has been posted. Check it out on the right sidebar of our Agendas & Minutes page. A reminder of how the Agendas and Minutes page works-- Interested in the upcoming meeting? The agenda and supporting materials are posted the Friday before the meeting. Just click on the “Agenda/Packet” link to open. What about information that was presented at the board meeting but was not in the packet? We will post that information after the board meeting under “Handouts.” When can I expect the minutes? Minutes are approved at the monthly BOE meeting. Once approved, they will be posted to the page. What if I don’t want to wait a month to find out what happened at a board meeting? On the right are “Board Briefs,” which will briefly tell you actions taken at a board meeting. These are posted a couple days after the meeting. Still having trouble accessing information? Call Kathie Poss @ 414.525.8411. Super Ninja Night at the Hales Corners Library is for learners in K4, K5 and 1 st grade and their families. Click here for more information. Monday is registration night at the middle school. See the flyer for more information. Click here to register. If you are donating a gift card, please drop that off at the school office in the Post Prom Envelope by Monday, May 7. Thank you for all your help and support! On May 11, students will participate in assemblies. 11th and 12th grade students will participate in the Ashley's Story assembly, sponsored by the Greenfield Police Department. 9th and 10th graders will participate in the Dare to Dream assembly, with Whitnall alum Tom Gilles. These assemblies will be a great opportunity for our students. If you have any questions about the assemblies, please feel free to contact the office. May 1 - May 4: Some of the 8th grade students will travel to Washington, D.C.
May 8 - May 10: Spring Concerts. 6th grade on May 8, 7th grade on May 9, and 8th grade on May 10. 7 PM each night in the WMS gym. May 9: PTO meeting at 6 PM in the WMS Library. The WMS coin war, called "Dollars for Doughnuts," will be the week of May 7. Save those coins to bring to school during that week. The winning Advisory at each grade level will receive doughnuts at the end! The 5th grade concert will be held Thursday, May 3 at 6:45 PM. The incorrect time was reported in The Connect last week. The 4th grade concert is at 5:30 PM also on Thursday, May 3. Our JDRF Walk to Cure Diabetes is at 10:00 AM on May 2. There is still time to donate by following this LINK . Wednesday, May 2 is going to be a busy day at HCE! It is our final CLAS mail day for the school year. If you want to send a letter to your child, here are the classroom addresses . Please drop off at HCE by 9:00 AM. The end of the school year is rapidly approaching! Take a look at our ABC countdown , which starts on Wednesday, May 2.